I cannot ever forget when this beauty flew from I know not where, to this black-eyed susan wildflower. I was just a few feet away and I’d never before seen Euphydras phaeton. I robotically lowered myself down onto my stomach and shot exposure after exposure, again and again. Moments went by and I was able to shoot out nearly an entire roll of slide film. Then it flew away, purposefully and soon it was out of sight. Happiness is . . . This Rector, Pennsylvania field was full of nectar filled wildflowers on this July morning. Excellent habitat for Baltimores because it was a short distance from ponds that had turtlehead wildflowers at their banks. A favorite in the state of Maryland, ranked officially as the State Insect. 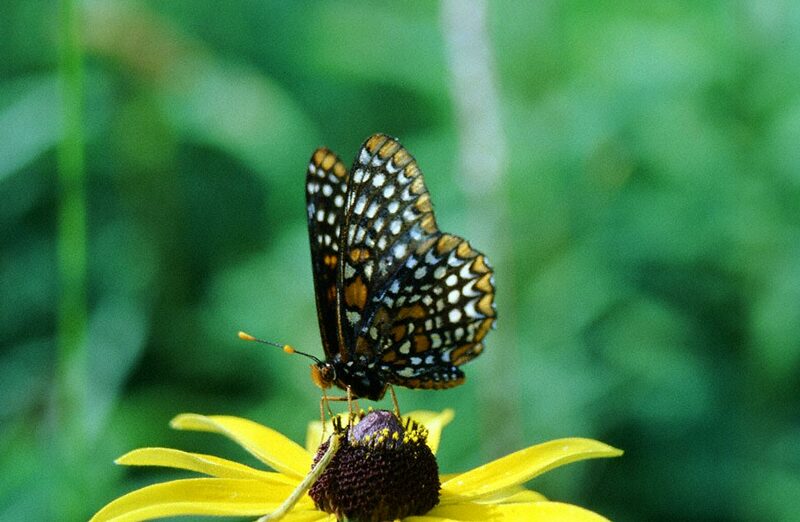 We’ve posted that black-eyed susan wildflowers are infrequent landing places for butterflies. Here of course we are reminded that these observations are general and not meant to be all inclusive. This was one of my very few encounters with a Baltimore Checkerspot. I’ve forgotten much of what happened yesterday, but I remember this encounter. I can’t remember seeing the tiny caterpillar which shares the flower. Lovely butterfly, we don’t have them this far south. Did have my first American Lady of the season today nectaring on Bidens alba.